Oil prices have remained steady at $74 due to supply disruption in Libya, Canada and impending sanction on Iran, all of which increases the likelihood of big shortfall in the oil market. Bullish oil factors are ruling over Bearish factors as investors are currently assuming that the oil supply increase from OPEC will not suffice the current oil demand and prevailing supply curtailments. Back in 2012, when US and EU imposed additional sanction on Iran which restricted Iran to export oil due to which the country’s production fell towards 2 mbpd from the pre-sanctions level of 3.8 mbpd. Later in 2015, the sanctions were lifted and the country resumed its production towards pre-sanction level. Last month in June, US withdrew from the deal and imposed sanctions on Iran that will repeat the episode of decline in Iran oil production and exports in the year 2018-19. US sanctions are about snap back in two parts, with a first round returning in August, and with the toughest sanctions returning in early November. US has also warned that it will impose sanctions on foreign companies that do business with Iran, in an effort to cut Iran`s exports of crude oil and condensates to zero from the current 2 million barrels per day. However, exemptions to few countries will be provided, with no criteria or specification given. Iran’s President Rouhani hinted at a threat to disrupt oil shipments from neighboring countries if Washington tries to cut its exports. "If they want to stop Iranian oil exports, we will not allow any oil shipment to pass through the Strait of Hormuz”. About 20% of the world petroleum passes through this strait, making it highly important route for the international trade. Therefore, any blockage in the strait could disrupt the world oil supply. “Loss of Iran oil supply can be replaced by US, leading to lower US crude inventories”. 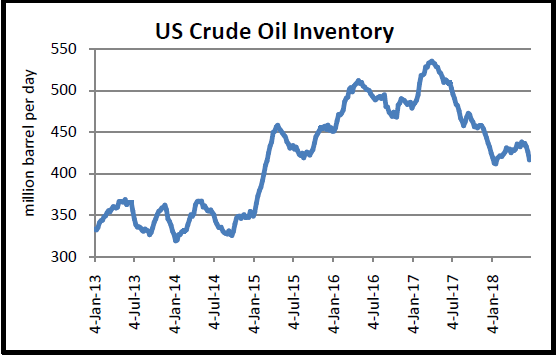 If Iran stops exporting oil to other countries, this loss of supply can be replaced by higher exports from United States which may lead to drawdown in US inventories going forward, another supporting sign for oil prices. prices. At present, total of 1.8-2.0 million barrels of unplanned supply outages have occurred in June 2018. Sakina Mandsaurwala works with Advance Market Research Group at Narnolia Research. Her forte is Commodity research. She is a Post graduate in Finance from KC College of Management studies.Sakina Mandsaurwala works with Advance Market Research Group at Narnolia Research. Her forte is Commodity research. She is a Post graduate in Finance from KC College of Management studies.